When you stop and think about it, humans use their jaw to chew food, yawn, talk, and more! In addition to all it’s many uses, the jaw can take the brunt of unnoticeable clinching, grinding and stress. This kind of use can result to deterioration of soft tissue and joint space, resulting in a very painful condition known as Temporomandibular Joint Dysfunction or TMJD. Less frequently, TMJ dysfunction treatment may require surgery or medications, but more often, chiropractic care offers a TMJ dysfunction treatment option found to be quite successful to an ongoing struggle for the more than 10 million Americans effected. 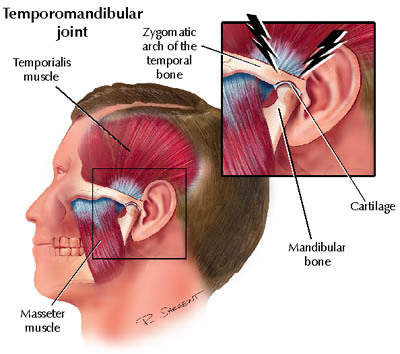 TMJ Dysfunction is characterized by an improper movement of the joint connecting the jaw to the skull. This joint is located just in front of your ear and is very intricate. There is a piece of cartilage (known as a disc) sandwiched between the joint and prevents the two bony surfaces from rubbing together. In most TMJ dysfunction, the muscles are so tight they cause the disc to get pinched between the two bones causing aberrant movement. The cause of TMJ dysfunction is relatively unknown, however, there are some theories suggesting it can be caused from excessive mouth opening, (talking often, taking large bites of food, chewing gum) increased bitting pressure (grinding teeth at night, chewing hard foods..etc) and some studies even correlate a genetic component to TMJ dysfunction. Additionally, it is also believed the dysfunction can result as part of skeletal maturation as the person ages, stress and even poor posture. One important area to consider is trauma to the jaw. Even though the accident itself may be an acute occurrence, chronic problems resulting in TMJ dysfunction can arise if not properly treated initially. Common accidents resulting in trauma to the jaw include: motor vehicle accidents, sporting events, and head trauma. Invasive dental procedures can also sometimes result in imbalanced musculature and should be evaluated. TMJ dysfunction can have many symptoms. The most common are headaches, jaw pain and clicking/popping when opening the mouth. Everyone experiences different symptoms and different degrees of them. We recommend you consult with the chiropractors at Turning Point Chiropractic if you have any questions. Our Saratoga Springs, NY chiropractic doctors are highly trained to help TMJ dysfunction. Numerous therapeutic techniques such as Active Release Techniques and ultrasound are used for soft tissue structures, as well as chiropractic care to correct for any postural alterations in the cervical spine. The doctors of Turning Point Chiropractic would be glad to meet with you in their Saratoga Springs office for a free consult about any questions you may have.